A stunning digital triple pack compiling three of Attack Records' key albums. 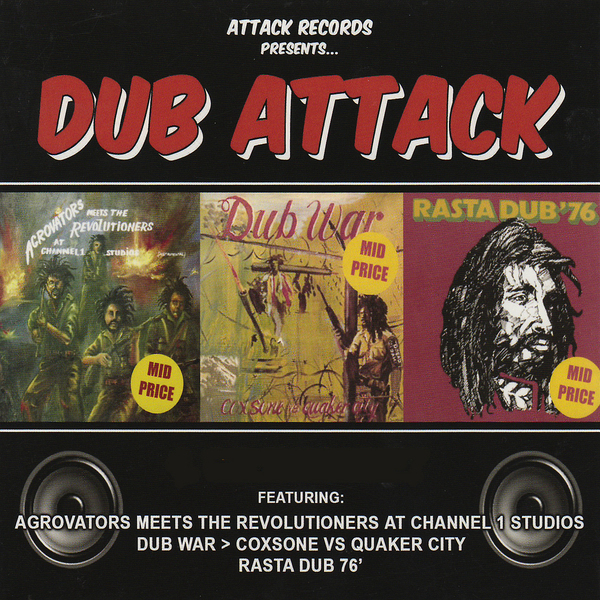 AGROVATORS MEETS THE REVOLUTIONERS CHANNEL ONE: Re-mastered to get the very best out of everyone's fancy stereos, 'Aggravators Meets The Revolutionaries At Channel One Studios' makes a welcome return on Cousin Records - given its almost unchallenged position in the dub/reggae canon. Originally released in 1976 under the watchful production eye of Bunny Striker Lee before being mixed by King Tubby and Prince Jammy, this is dub in its purest form - with the likes of 'Bionic Man', 'Super Larger', 'Russian Stout' and 'Big Foot' all strutting into view as the very essence of reggae. Sounding as fresh as it must have done thirty years ago, this is quite the buy for anyone with even a glancing interest in the genre. DUB WAR: Produced by Bunny Lee and mixed by Scientist at King Tubby's studio, this long sought after Dub War album sees the light of day again - bringing together Coxsone and Quaker City. Originally put out back in the mists of 1981, the record is a fierce dub testament that brings together the raw and tender side of the genre. Something of a lost grail amongst those who know their dub history, Coxsone vs. Quaker City sees two of the UK's most legendary soundsystems doing what they do best... clashing. RASTA DUB '76: A long out of print reggae classic, the Aggrovators' 'Rasta Dub '76' is a Bunny Lee produced gem that was further dubbed up by the man King Tubby for extra pleasure. Catching them at the apex of their collective talent, 'Rasta Dub '76' is a thick and humid collection that sees the Aggrovators fully exploiting their often tense sound to its full potential, with the likes of 'Fatty Boom Boom Dub', 'Hold On Dub' and 'Ja Ja In De Dub' incorporating just as much shadow as light.